Ocean Cove is a private waterfront community burrowed between the Atlantic Ocean, Intracoastal Waterways, and a nature preserve. This exclusive gated community provides homeowners with luxury and paradise all within walking distance to Florida’s sandy beaches. 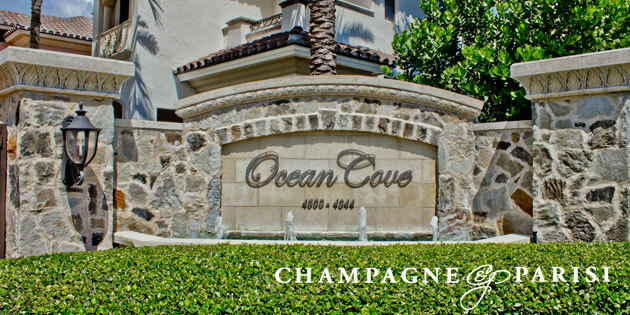 22 upscale homes comprise the intimate Ocean Cove community and range between 4,000 square feet and 6,000 square feet. These single family estate homes come with between 4 and 6 bedrooms and have been constructed in a Mediterranean luxury style that can be seen from in interior and exterior. Each piece of Highland Beach real estate within Ocean Cove comes with various upgrades including marble floors, spacious floor plans, oversized gourmet kitchen complete with wood cabinets, granite countertops and backsplashes, islands, stone fireplaces, private elevators, vaulted ceilings, crown molding, private balconies, private docks, infinity edge pools, summer kitchens, and so much more. Every property has a stunning view of the Intracostal, Atlantic Ocean, and gorgeous nature preserve, among the other tropical scenery. As a resident of Ocean Cove you will have access to a private beach where you can enjoy the crashing waves while soaking up the Florida sunshine. With Florida’s beautiful weather year round, Ocean Cove residents can enjoy activities such as swimming, diving, snorkeling, paddle-boarding, wake-boarding, surfing, kayaking, boating, and many other fun water sports. If you own a boat, enjoy easy access to the water with no fixed bridges. You can take your boat up and down the Intracoastal enjoying fine dining on the water. Living in Ocean Cove you are also within a short distance from all the surrounding city activity. Between the famed Downtown Delray Beach Atlantic Ave, and Boca Raton’s well-known shopping boutiques there is fun for everyone beyond the beach. You will even be close to two international airports and major highways.